Resources "C.C. CAMP IS A SWELL PLACE FOR A BOY TO LEARN." The nation's first camp, Camp Roosevelt, opened at Luray, Virginia, near Massanutten Mountain in the George Washington National Forest in May 1933. 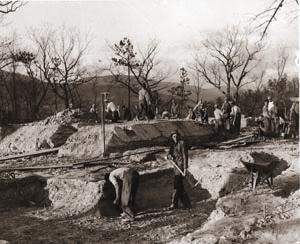 The Forest Service (in the U.S. Department of Agriculture) and the Park Service (in the U.S. Department of the Interior) used CCC workers all over the commonwealth on such projects as the Skyline Drive and Colonial Parkway as well as erosion prevention and reforestation schemes. The CCC also built cabins and recreational facilities in six state parks-Douthat, Fairy Stone, Hungry Mother, Seashore (now First Landing), Staunton River, and Westmoreland-that opened in June 1936. Camps typically consisted of barracks, mess hall, motor pool, infirmary, headquarters, officers and staff facilities, and usually a recreational hall and classroom buildings. 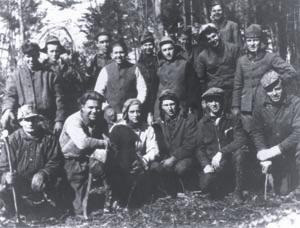 Operated by the army but overseen by the War, Labor, Agriculture, and Interior departments, the CCC enrolled jobless men in work camps for about $30 per month, $25 of which was sent to needy dependents. Many of the original facilities in Virginia's state parks and natural areas were built by the CCC and are still used today. 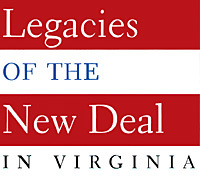 As a testament to the enduring legacy of FDR's "Tree Army," the National Sporting Goods Association's Sports Foundation Inc. gave Virginia its state park gold medal in 2001.